Closely based on former WWI German soldier Erich Remarque’s novel of the same name, this 1930 anti-war film won the Academy Award for Best Picture and also a Best Director Oscar for Lewis Milestone. The story examines the horrific and senselessness of a German soldier’s experience in the literal trenches of WWI. The film opens by introducing viewers to the militaristic nature of Germany in 1914, with German soldiers marching to martial music and professors urging students to enlist for the glory of the fatherland. This is where we meet Paul Baumer (Lew Ayres) and his friends Kropp, Leer, and Kemmerick. We watch as they enthusiastically arrive at boot camp only to see them soon broken down by a brutal commander. After finishing their training, the young soldiers are sent to a war-torn French town on the outskirts of the front. Here they meet cynical and grizzled front veterans, who enlighten them about the shortage of supplies, specifically food. Luckily they have the very industrious Kaczynski, who finds a pig and is willing to trade pork for other comforts, namely cigarettes and booze. Kaczynski serves as the voice of truth about what war entails and is about. Soon the soldiers are sent to the front to string barbed wire and are introduced to shell fire. One of the boys is blinded by shell fire and then is killed as he runs toward enemy lines. From here we watch the soldiers hunker down in bunkers for endless days of exploding bombs and sporadic machinegun fire. We see soldiers have nervous breakdowns, deal with a rat invasion, and endure hunger and sleeplessness. Once the bombing dies down, the soldiers find themselves in a battle in no-m an’s land. Using mobile crane shots, Milestone captures some of the most realistic battle scenes in film history. Intercutting charging soldiers with machinegun fire, Milestone creates images that stress the chaotic and dizzying nature of warfare. One scene shows a French soldier completely obliterated by a grenade—only his hands are left, which we see gripping barbed wire. Another scene shows rows of soldiers fall down like dominoes against machinegun fire. At the end of this battle, the French reach the German trench and force the Germans to retreat to a further back trench. The camera then scans the battlefield to show thousands of bodies. 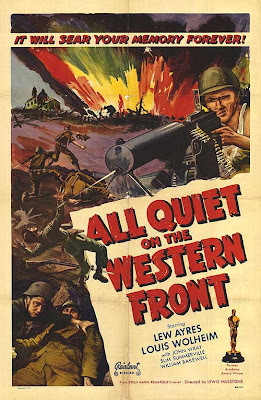 Then, in an excellent indictment on the futility of war, the film looks as though it was being run in reverse, as the Germans mount a counter-attack and push the French back to their former position. This was not a sanitized war film. When they return from the trench the soldiers are fed and told they will return to the trenches the next day. This launches the German soldiers to philosophize about why war is conducted: to give generals something to do and to make manufacturers rich. While in town, Paul and other soldiers visit a dying Kemmerick in a makeshift hospital. Amplifying the horrors of war, we watch as Kemmerick realizes his leg has been amputated. One soldier callously asks Kemmerick for his boots since he obviously no longer needs them. After watching Kemmerick die, Paul takes the boots back to camp. These were evidently bad luck boots, because what follows is a montage scene of the boots being passed to a new owner every time the former owner dies. Later in the film, Paul finds himself in battle in a graveyard where he is struck in the head. As he takes cover, a shell explodes and Paul has a decimated coffin land on him—a foreshadowing of things to come. While hiding in a shell hole Paul find himself face-to-face with a French soldier, who he stabs in the throat with his bayonet. Unfortunately the French soldier doesn’t die easily, and Paul has to listen as the Frenchmen groans in agony. We watch as Paul waffles back and forth, praying for the soldier to die and then later hoping for his survival. When the soldier dies, Paul has a desperate conversation with the dead man for forgiveness. Soon after escaping the shell hole, Paul is severally wounded and take to the hospital where he watches yet another one of his friends scream in agony about having his leg cut off. When he recovers from his injury Paul is given leave and he returns home, where he finds himself unable to deal with peace and quiet. He visits his sick mother and lies about how the war really is. He then finds his father and his friends out of touch with the realities of war, who tells him that he must risk his life for the honor of Germany. After leaving this group he is accosted by a former professor to address his students of the honor of being a German soldier. Shocking his professor, Paul gives a pacifistic speech about the truth of war. In a sadly ironic turn, the class boos Paul and calls him a coward. Because of this incident Paul decides he can’t take the unrealistic world away from the front and decides to return four days early. When he returns to the front he finds most of his company dead. In a bitterly tragic scene, an aerial bomb wounds Kaczynski. 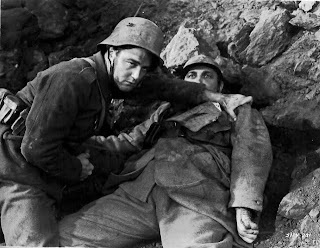 Paul good-naturedly tells him the war is over for him and begins to carry him on his shoulder to a medic. Just then another aerial bomb explodes behind them and a bomb splinter kills Kaczynski, unbeknownst to Paul who continues talking to him. When he tries to give water to his friend he is shocked and dazed to find him dead. If this scene wasn’t heartbreaking enough, the closing scene is haunting. On the eve of the armistice, Paul is daydreaming in a trench about the coming peace when he sees a butterfly (he collected them before the war) through his gun-hole land just outside the trench. We watch as he starts to reach outside the trench and at the same time a sniper takes aim through a rifle scope. The next thing we hear is the shot that sends Paul to his death. The film closes with the image of countless white crosses and the ghosts of Paul and his friends marching into a void, who look accusingly back into the camera. This is one of the greatest war films ever made. When you watch it today it does not seem dated at all. The grim images captured are mesmerizing and realistic. The message of the complete uselessness of war is not heavy-handed here. Instead, the true reality of what war looks like is bitterly emphasized. The overall performance of Lew Ayers is exceptional. He goes from enthusiastic recruit to grizzled, disillusioned veteran seamlessly. If you are a WWI history buff or you enjoy truly great war films, you must see this film. It certainly deserves its Oscars! It carries a message and it is delivered with a vengeance, but that does not ruin the movie at all. I think it compares well with other anti war movies like Deerhunter or Full metal Jacket. Yes, it belongs in the anti-war category of war movies. There is no sensationalism or flag-waving about it. This is a fine article about a truly powerful film, which features one of my favorite actors, Lew Ayres, in his second film appearance. I commented on your "Love Me Tonight" article to invite you to my upcoming blogathon. I hope that you'll be able to join me!